Today was a beautiful spring day. A beautiful day such as this one calls for a fresh, tasty moreish lunch to be shared in the sun with friends. Today, I chose to make a ridiculously easy tomato tart to be enjoyed with a big glass of crisp cold white wine. I didn't want to be slaving away inside all morning in the kitchen, so after a long morning walk I made up this in about 5 minutes. A good couple of handfuls of cherry tomatoes. Some mozzarella, a good shake and sprinkle of sea salt and black pepper for decoration. 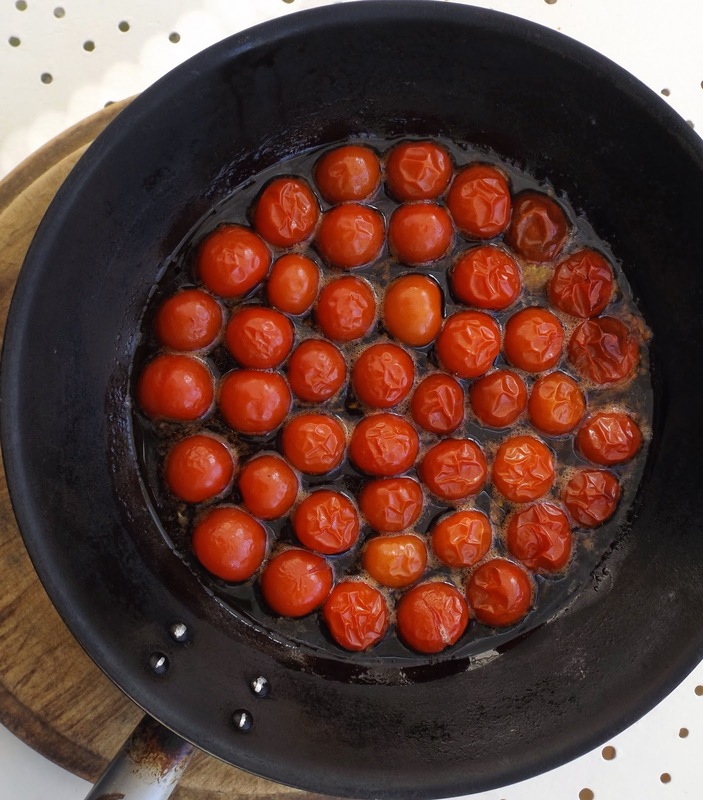 First, chop all your tomatoes in half and place them face down in a pan with lots of oil, balsamic vinegar and salt and pepper, roast them for about 15 minutes. Then carefully turn out your tart onto a plate and decorate by tearing apart some mozzarella and fresh basil. Serve with a spring of cherry tomatoes for effect and get tucking in! Enjoy this tart on a sunny day in the garden, its so easy but tastes and looks very impressive to your guests.